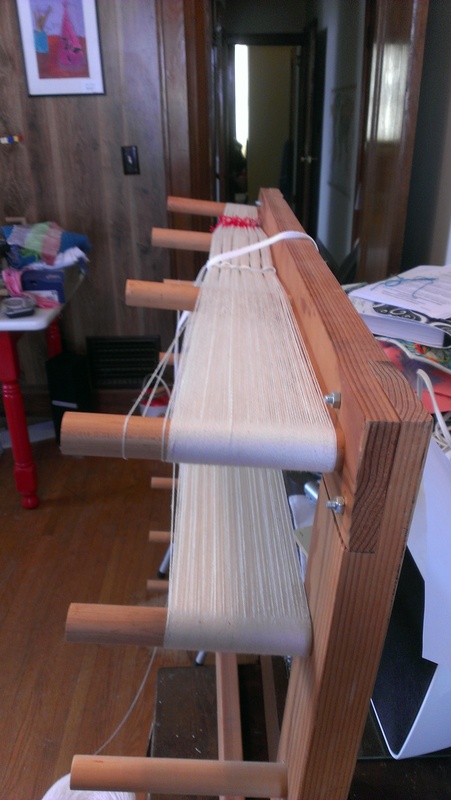 The warp has been beamed onto the warp beam and I have threaded the heddles. 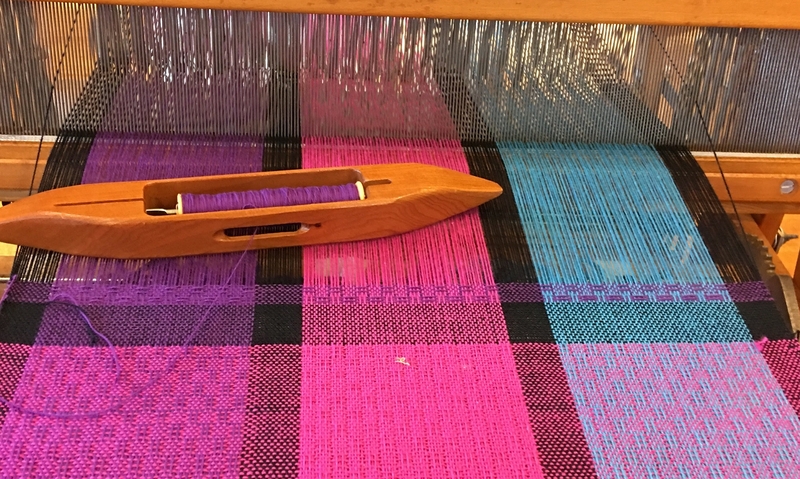 I had a bit of a setback on Monday, I got the warp on the loom, spread it out to 22 inches and beamed it on only to look at it and think, “something is not right”. I had only wound half of the number of threads needed. So, I carefully unwound the warp from the beam, scooted everything closer together onto one side, and wound more warp. I then put that on the apron rod with the rest of the warp and beamed it all again. I got most of the heddles threaded into the pattern yesterday and finished up this morning. I started to sley the reed with the normal reed hook, but it was sooo slow. I have gotten used to the auto reed hook, so I had to look for it in my unorganized studio (I promise to work on organizing) and am now sleying faster. No it doesn’t automatically sley the reed for me, it just moves from dent to dent on its own, while I pick the threads, catch them with the hook and pull. I can leave it in a dent and do something else with my hands, and it doesn’t fall out, and most importantly, I don’t accidentally skip a dent while sleying. Here’s a short video to show how I use it. It works best if the reed is laying flat, not standing up in the beater. After I run a few errands, I should be able to finish that up quickly and get to the real action of the day, weaving! I recently took over one of the bigger bedrooms in the house as my studio. I got it sorted out enough today that I could wind a warp to start a project. What that means is that I am measuring and counting the warp threads (in this case undyed 8/2 ringspun cotton). I need 528 ends (strands of warp) that I will sett at 24 e.p.i. (there will be 24 strands in each inch of my warp). This project is dish towels which will be 22 inches wide on the loom. Even before beginning to wind the warp, I had to plan out my pattern to fit into 22 inches with the yarns that I chose to use. The pattern is a twill, and 8/2 cotton is good at 24 e.p.i. for a twill pattern. I chose a pattern from Marguerite Porter Davison’s book A Handweaver’s Pattern Book on page 44 titled “Caroline Halvorsen’s No. 30”. This is a classic book of 4 shaft patterns for weaving, that was written in 1944. There are 4 variations of the pattern that I can treadle by changing what feet and treadles I use in sequence. My warp will make 4 towels, so each towel will be a different variation of the pattern. To make the 4 towels I need 4 yards of each strand. The pattern is a twill, and 8/2 cotton is good at 24 e.p.i. for a twill pattern. I want 22 inches wide on the loom, so my warp takes 2112 yards of yarn. This 8/2 cotton has 3360 yards in one pound of yarn, so I am using almost 2/3 of a pound of yarn. These kind of calculations are necessary to know that you have enough of a given yarn to make the project (or to know how much to buy) and to know how much your project costs to make for pricing decisions, for inventory and for profit calculations. I have a limited amount of the yarn that I chose for weft (the threads that I weave with), and wanted 4 towels as wide and as long as I could make them, but still trying to keep the weaving width a multiple of 2 inches with 24 ends per inch. I have a loom with a warp beam that has 2 inch sections, so to make warping easier, I try to keep my projects a multiple of 2 inches. I changed the draft in the book a little to accommodate this by increasing the number of ends in the first and last repeat of the pattern. There are lots of decisions to make before you even start to wind your warp. I have been thinking about the project for a while, but actually sat down with a calculator, graph paper, my spreadsheet and weaving software this morning to pull it all together. So, off to wind more warp and perhaps get it wound onto the loom today. 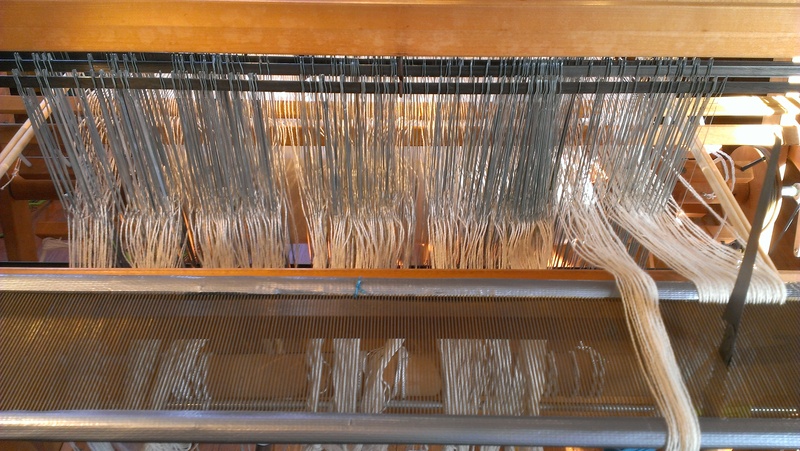 Tomorrow, I will need to thread the strands through the heddles on the loom in the order required to make my pattern. 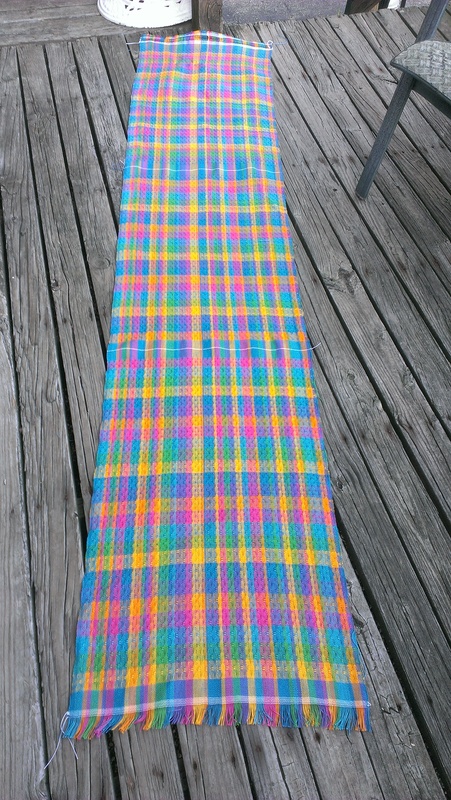 I finally sat down to finish the last three towels on the warp I put on my loom over a year ago. The first three were cut off and submitted to the towel exchange we had at the Weavers Guild of Greater Cincinnati. Then, these three languished while I worked on lots of knitting and rigid heddle weaving. Here is a picture of the finished towels before washing, cutting and hemming. Waffle weave is a heck of a lot of fun and fast to weave. The hems are slow as molasses though. They are made in boundweave and I need to use a fork to pack the weft in to fully cover the warp. So I guess I have breakfast: waffles with molasses using a fork!